Showers of Books Giveaway Hop hosted by I Am A Reader Not A Writer and Books a la Mode. HEY BOOK NERDS! I felt like I needed to give another giveaway boost just a fortnight ago when I finished reading The 5th Wave By Rick Yancey. I mean, seriously, THIS FREAKIN BOOK RULES! So naturally, I’m going to host a giveaway (INTERNATIONAL) of a pre-order of The 5th freakin Wave By Rick Yancey. Please note that this is only to people who can be shipped to by The Book Depository. Sorry peeps! The Passage meets The Hunger Games in a gripping new series from Carnegie-shortlisted Rick Yancey. After the 1st wave, only darkness remains. After the 2nd, only the lucky escape. And after the 3rd, only the unlucky survive. After the 4th wave, only one rule applies: trust no one. Now, it’s the dawn of the 5th wave. On a lonely stretch of highway, Cassie runs from Them. The beings who only look human, who roam the countryside killing anyone they see. Who have scattered Earth’s last survivors. To stay alone is to stay alive, until Cassie meets Evan Walker. Beguiling and mysterious, Evan may be her only hope for rescuing her brother and even saving herself. Now she must choose: between trust and despair, between defiance and surrender, between life and death. To give up or to get up. Cassie Sullivan gets up. Stalk the giveaway hop on these blogs! Can’t wait to read The 5th Wave – I’ve heard such good things about it and certainly looks like a dystopian novel that stands out from the rest. I’ve heard such good things about this! Thanks for the giveaway. Can the winner choose ebook? Thank you so much for this giveaway! I’ve been eyeing this book and you just made it wish a come true! 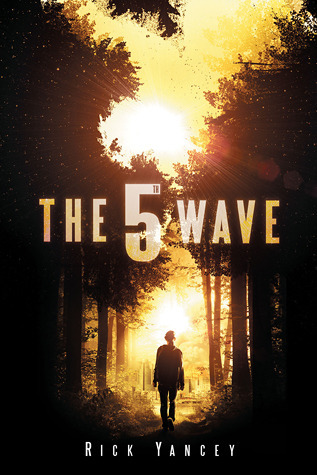 I want to read the Fifth Wave because it just sounds so unique and awesome. I love thriller novels and this one seems right up my alley. Also, almost everyone’s reviews I have read (including yours) has been almost all positive. 🙂 Thanks for the chance to win! Ooooh, this book sounds so gory – and FUN! Thanks for the chance to win!!! I love your beautiful blog and it’s deep, rich purple. I love Spring. It’s when the cold and ice of winter melts away and flowers begin to bloom. The grass becomes green again. The birds chirp in the trees. And the weather warms, which is probably the very best part! So far, I have experienced many April showers. I can’t wait for their inevitable consequence: flowers! Thanks for the giveaway and Happy Spring! I really like it because it look different form the other dystopian books. The concept is thrilling. I love the color, name, and the way you mark it (with the little boat things). Well about your blog…I FREAKING LOVE IT!!!!!! You get so many reviews back, you try and reply back to comments, your reviews are long, informational but still fun, and all of your blog design and memes! And we’re about the same age so we can both connect on being young bloggers! I am just so impressed by your blog and what you have been able to make! <3 Oh and about the book...I love the cover (can you say intense?!) and an enticing and intriguing summary makes me want to read it a lot! Plus you gave it five stars and I have heard nothing but good things, so add up all of that I am dying to get my hands on a copy! Especially a pre-ordered one! ;) Okay, I should probably go now. *waves* Bye! I’ve heard nothing but good things about The 5th Wave and I love SF, so this books just sounds great. Lots of action, lots of suspense. What more could you ask for? I’ve heard some freaking amazing things about THE 5TH WAVE. Everyone seems to love it, and it has ALIENS!! I am obsessed with dystopian novels, have been since high school when I read 1984, Animal Farm, and A Handmaid’s Tale. I especially love YA dystopian. I am invested in several series, but there seems to be room for yet another in my heart. I have seen so many great reviews and tweets praising this book and it has made me so excited to read it. I read a lot of dystopian books and I’m hoping this one will bring something new and exciting to the table. The trailers alone already have me hooked. I can’t wait to get my hands on this book! Great choice for the Spring Giveaway. Spring brings new life. Sounds like the Fifth Wave is about looking at things from a fresh approach also. I enjoy dystopian novels and especially those with a strong female character. Thanks!!! Dystopian is my favorite and this sounds like a great one! I’ve been seeing a lot of good about it! I keep hearing great things about this! Excited to read it! Thanks! I love dystopian fiction and have heard great things about it. Thanks for the great giveaway!